The UNM Center for Teaching and Learning 2016-2017 teaching fellows showed off their teaching skills as well as their methods and practices on how they are incorporating different and modern methods of teaching to improve learning and interest here at UNM. Due to technical difficulties, the presentation of Dr. Leandra Boucheron (above) is not displayed. Dr. Erik Erhardt, a statistics professor at UNM, shared his knowledge on how he is striving to improve the success rate and interest in Statistics at UNM. Dr. Les Field, a professor of anthropology at UNM, expressed how he is trying to improve and further excite students to become further interested in anthropology. Dr. Dan Wolne, a professor of religious studies at UNM, shares his knowledge on how he is trying to improve his teaching criteria to further excite and engage students in his courses. Dr. 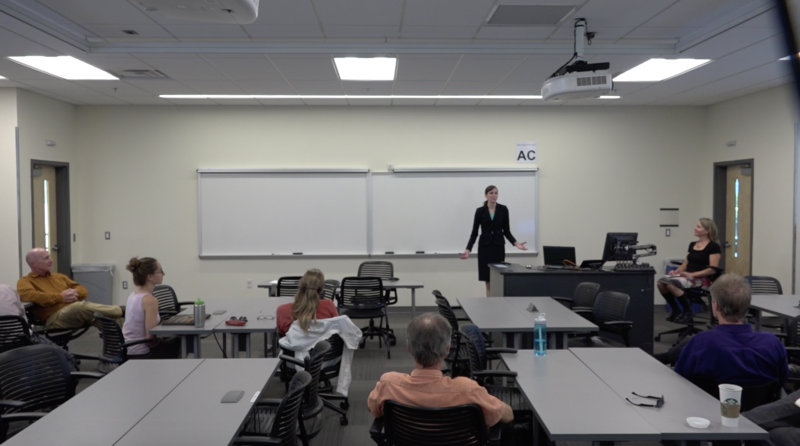 Dawn Nordquist, a linguistics professor at UNM, shares how she is aiming to incorporate new technology to improve her student’s interest and further their understanding of linguistics. Dr. Justine Andrews, an art history professor at UNM, shared how she is testing various methods of teaching to help students become more interested in art and art history.